The National Academy of Sciences is the U.S. adhering body of the International Commission on Mathematical Instruction (ICMI) and it maintains its relationship with the commission through the U.S. National Committee (USNC)/MI. ICMI is a commission of the International Mathematical Union (IMU), which fosters efforts to improve the quality of mathematics teaching and learning worldwide. The International Commission on Mathematical Instruction is pleased to announce the next ICMI Study Conference. The ICMI Study 25 Conference on Teachers of Mathematics Working and Learning in Collaborative Groups will be held in Lisbon, Portugal, February 3--7, 2020. For information on the ICMI Study series, visit https://www.mathunion.org/icmi/activities/icmi-studies. To register for the conference and/or submit a paper abstract, please visit http://icmistudy25.ie.ulisboa.pt/. All abstract submissions are due by June 30, 2019. "Connecting Math Educators from Across the Globe: Resources, Lessons, and Future Work"
Description: The International Seminar on Math Education has been a venue where teachers from many countries learn how math teaching is affected by factors such as culture, language, and policies. We will share resources and activities and lessons learned, and brainstorm ideas for moving forward with the work of connecting math educators from around the globe. Description: The 14th International Congress on Mathematical Education (ICME-14) will be held in Shanghai from July 12--19, 2020. Although it is fourteen months away, this session will provide an overview of what congress attendees may experience and what you as an educator can gain by attending. To register for the 2019 NCTM, pleas visit https://www.nctm.org/annualreg/. The U.S. National Committee for Math Instruction congratulates Padhu Seshaiyer on his honorary doctorate for scientific excellence from Vrije Universiteit Brussel. Dr. Seshaiyer, a member of the USNC/MI, is one of multiple recipients honored this year for being "committed scientists who transcend the boundaries of their own disciplines." Lists of past awardees can be found here. "School Mathematics Curriculum Reforms: Challenges and Changes," was launched in February 2017 as the 24th ICMI study. The study is co-chaired by Renuka Vithal (South Africa) and Yoshinori Shimizu (Japan), and American mathematics education expert Al Cuoco (Education Development Center) is also a participant. A volume of the study will be drafted in 2019 and is expected to be presented at ICME-14 in 2020. The Study Conference for ICMI 24 was held from November 25--30, 2018, in Tsukuba, Japan. Dr. Bill McCallum (University of Arizona) and Dr. Jeremy Kilpatrick (University of Georgia) were featured among the plenary speakers. For more information, please visit the study conference website. The USNC/MI is proud to announce that it will be organizing a series of webinars on math education. The first webinar, hosted by the American Mathematical Association for Two-Year Colleges (AMATYC) focused on issues in language and learning mathematics. The webinar, which took place on Thursday, August 30, 2018, was attended by a total of 63 participants. A YouTube recording of the event, PowerPoint slide PDFs, and handout PDFs are all available on the AMATYC webinar page, located here. Featured presenters were Dr. Judit Moschkovich (University of California, Santa Cruz) and Dr. Richard Barwell (University of Ottawa). Using research in mathematics education, second language acquisition, and sociolinguistics, the presenters used examples to explore common myths about mathematics and language. The complete webinar, uploaded by AMATYC, is available on YouTube. 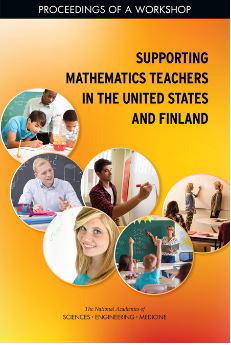 Proceedings of the Workshop on Supporting Mathematics Teachers in the United States and Finland: Now Available! Workshop on Supporting Mathematics Teachers and Teaching in the United States and Finland, a bilateral meeting of U.S. and Finnish mathematics educators, was held July 31--August 2 at the University of Helsinki in Helsinki, Finland. Approximately 15 American professionals and 15 Finnish professionals attended in person, while several online participants engaged remotely via the webcast. The workshop proceedings are now available for download (PDF) or purchase (hard copy) on the National Academies Press website. CLICK HERE to visit the U.S.--Finland Workshop subpage and view session videos, download presentations, and more. Shanghai, China, was selected to host ICME-14 in 2020. Click here for the complete announcement. Two Americans are serving on the International Program Committee (IPC) that will be held in Shanghai, China from July 12 through 19, 2020. Additionally, the USNC/MI is planning to submit a proposal for a U.S. presentation at the next Congress. This material is based upon work supported by the National Science Foundation under Grant Number DRL-1445101. Any opinions, findings, and conclusions or recommendations expressed in this material are those of the author(s) and do not necessarily reflect the views of the National Science Foundation.